Marlies Fischer-Zillinger and Claudia Weissauer, a physiotherapist and a riding instructor, are brought together by a passion for horses and by the idea of combining specialist knowledge to teach their proven seat training courses. 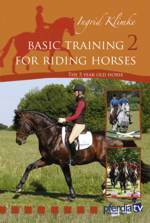 This DVD shows you how to develop a soft seat that moves with the horse, the correct aids and the wrong effect by using slow motion studies. Featured are: A seat that moves with the horse  Breathing  Correct stirrup length  Movement of the walk in the saddle  Riding with the cushion  Riding with rubber stirrups  Alignment  Rising trot  Sitting trot  The seat on turns  Lateral aids. A straightforward training system which teaches riders to achieve rhythm, balance, suppleness and the desired round flexor 'on the bit' frame in four easy steps. Four exercises form the building blocks of Grand Prix dressage and are the cornerstones of balanced riding. They teach riders to control the whole horse and improve every movement in dressage and jumping. This is a simple, logical, sympathetic training system based on using equine biomechanics coupled with the concepts of Classical Equitation. It demonstrates, in live lessons, the method in which to learn, improve and refine your riding technique to train your horse and to teach others to master the skills. A fascinating and supreme discipline of classical equitation, the art of Long Reining. This film shows you, step by step, how to from the beginning up to Haute Ecole, from equipment needed to Piaffe, Passage and Spanish Walk. Saskia Gunzer has been working successfully for many years as a trainer in the disciplines of work in hand, free schooling, circus tricks and work on the long reins. She trains horses from a wide variety of breeds on the long reins up to Haute Ecole and her expertise is highly sought after. Her performances with her Arabian thoroughbred Dimitri enchant her audiences. Complicated or boring? Quite the opposite! To work with cavaletti is a satisfying change of the daily training routine and is a pleasure for horse and riders. This DVD shows everything you need to know for your training at home, featuring the Olympic dressage stallion 'Damon Hill', when he was only 3 years old, as well as other horses. 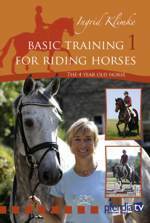 The latest in the Claire Lilley training series of DVDs is now available. Whether you are a novice rider just starting out, or an experienced rider wanting to brush up on your skills, this DVD is for you, whatever your age! Divided into lessons, you can either watch the whole film, or a lesson at a time. Stop! How to halt and control and balance your horse with half-halts. Go! Riding perfect transitions between the gaits, understanding 'forwardness'. Turn! How to ride turns and circles with precision. Learn the difference between flexion and bend. Programme includes the option for subtitles in English and German. Kelly Marks specialises in horse psychology and behaviour and works to find solutions that benefit both horse and owner. 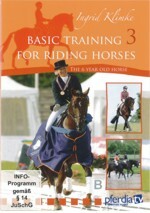 This DVD gives a unique insight into Intelligent Horsemanship with solutions and advice that any owner can relate to. It also follows Kelly as she embarks on a nationwide tour meeting her team of helpers and the horses she works with also how she tackles common equine problems. The Scales of Training refer to the basic schooling of every horse whether the rider wishes to concentrate on dressage, jumping or cross country and are essential to any horses physical and mental development. Exercises are given to help you improve your horses level of training, including the use of ground poles, music and other schooling suggestions. The Scales of Training are - Rhythm-Suppleness-Contact-Impulsion-Straightness-Collection. Susan Harris presents her popular 'Visible Horse' demonstration with the muscular and skeletal systems painted on a live horse. This fascinating presentation shows in vibrant colour how a horse's bones and muscles work in motion. Approx.52 mins.